A. Hymnz (born Jason Furman) is a multi-talented artist hailing from the Central Valley of California. For the last two decades he has taken on the elements of hip-hop in his own way, exploring the world as an ex-b-boy, graffiti, and recording artist. A. Hymnz is known for his high-energy delivery, along with powerful, descriptive lyrics that formulate imagery through various styles. 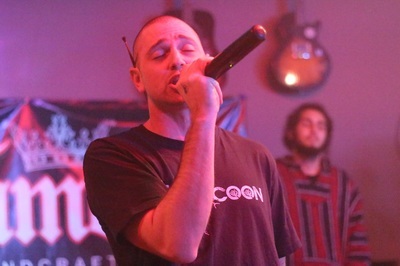 A member of Universal Roots, ArtRme, Roach Collection and Cold Frames, A. Hymnz has released several mixtapes and projects since early 2000 and has shared the stage or collaborated with artists such as Sole, Myka9, 2Mex, Factor, Noah23, Ceschi Ramos, Astronautalis, Bleubird, Kristoff Krane, Brzowski, A-Plus, and many more.